What started out as quite an enjoyable memoir, deteriorated into a rather self-indulgent meander of self-discovery, with the help of the works of J.D. Salinger. Rakoff writes of her year working for her ‘Boss’ at ‘The Agency’, but more about that later. She’s 23 and has drifted slightly from her planned life-path and having returned from a desperately lonely sojourn studying in England. She’s dropped out of graduate school, secretly discarded her college boyfriend (heaven forbid her parents find out! ), and is at a bit of a loose end. She meets Don – and moves in with him. In a nutshell, he’s a bully – arrogant, self-absorbed and selfish. I have no idea why Joanna stayed with him for so long! But he is the cornerstone upon which her New York life, at that stage, revolved, especially after her parents inform her that she is now responsible for her outstanding student loans, making her financial situation rather tenuous. I think they placed far too much faith in Joanna’s ability to behave like an adult – she seems incredibly naïve and vulnerable for someone of her age in the mid-nineties. Joanna lands what she feels is her dream job at ‘The Agency’(if you Google it, apparently it’s easy enough to discover the actual name of said Agency), as assistant to her ‘Boss’ (again, easily identifiable through Google). The Agency is a little cultural island all of its own, being one of the last remaining vestiges of the ‘old’ way in which business was conducted in the literary world: no computers; letters typed on electric typewriters, the use of Dictaphones, an intricate system of little cards to keep all submissions in order. And it would seem that The Agency exists in a bygone era purely because its best known client – Salinger – abhors anything remotely related to the literary world’s shift into more up-to-date methods. It’s all quite ridiculous! Rakoff’s job includes dealing with the copious amounts of Salinger fan mail that arrive on a regular basis. She’s given a form letter to type in return to these, explaining Salinger’s obsessive need for privacy and his explicit request that no mail be forwarded to him. Is this supposed to add to his sense of mystery, or is it purely rude and arrogant on the Agency’s part? We’re left to our own devices on this one. Yes, I believe Salinger was quite a stickler for maintaining his privacy, but it’s possible he might have been not wholly averse to seeing a few of the letters sent to him. Despite strict instructions to stick to the form letter, Rakoff cannot help but personalise some of the responses, not always to the satisfaction of the recipients. 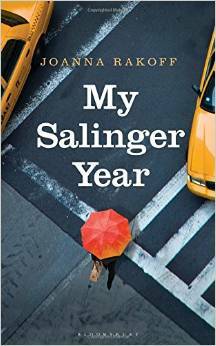 Eventually, some months after starting at the Agency, having never read a Salinger book, but now feeling that he’s part of the fabric of her very existence, Rakoff devours all of his works within one weekend and suddenly feels she has a clearer understanding of ‘life, the universe, and everything’, which she feels she needs to enlighten us all with. By this point, the book becomes tedious, and I just wanted to get to the end, which seemed to be quite an abrupt attempt to tie everything together. I’m not sure it does that satisfactorily. As a non-American, forgive me for saying it’s all very ‘American’! I’ve never read Salinger, so even though I don’t understand the significance his work holds in American literary history, I do know that he holds a lofty position there. I respect that, I really do! But I do think that if everyone who has ever felt the keen influence of a Salinger book, no matter how peripherally, feels the need to share that with the rest of us, the literary world might be in a bit of trouble!